I’ve wanted to do a CLS write up for a while and finally had a nicely suited project to use. When the warm weather ends I clean out the shop from summer projects and get ready for some indoor fun through winter. This almost always turns up something interesting I forgot I had. 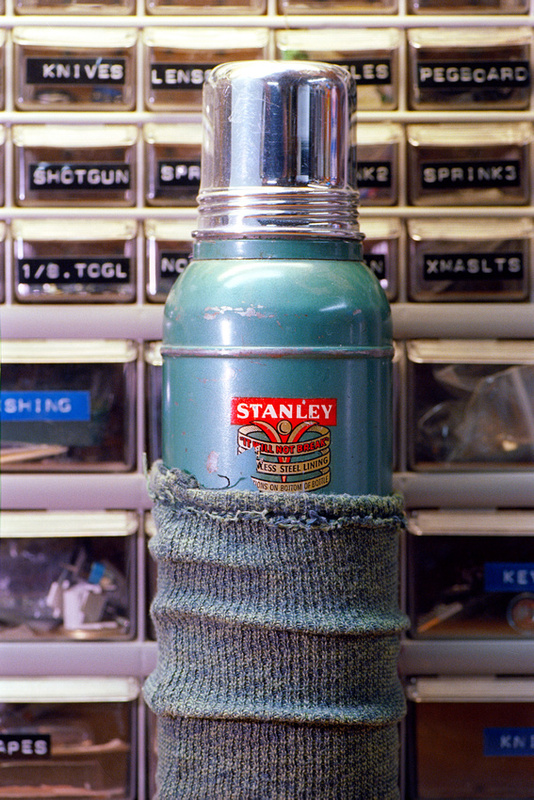 This time it was this antique STANLEY Thermos, complete with frayed, knit sock. I thought it would be an appropriate entry to my Shop Series. So I’ll use the Thermos shot to introduce a few CLS components and how to work with them. You’ll see it’s pretty simple, but without a “quick start” it’s easy to file CLS into the “I’ll get around to it some day” bin. STANLEY Thermos Project – black and white: Film photography with off-camera flash using Nikon’s CLS is one of the truly great things about shooting film with the Nikon F6. The setup: The F6 with the Nikon SU-800 Commander head mounted in the hot shoe; the Nikon SB-800 Speed Light (at left behind the diffusion panel) and the Nikon SB-R200 Speed Light at right with the white diffusion panel in front of it. Stanley Thermos Project – color. Nikon F6 + Kodak Ektar, developed in Cs41 color developing kit. a) The SU-800 Commander head. Because the F6 does not have a built-in flash, access to the CLS control is through the SU-800 mounted on the camera’s hot shoe. The SU-800 looks a little like flash but doesn’t actually contain a strobe unit. This is the brain, so to speak. You could also use a CLS capable speed light like the SB-800. This also has a “Commander” mode allowing access to the same functionality. Nikon F6 and Wireless Speedlight Commander SU-800. At first glance it looks like a flash – but there’s no strobe unit. The red center emits a beam allowing focus assist in low-light conditions. The SU-800 retails for about $250 and uses 1 3-volt CR123 battery – the same battery as the F6 without the grip. Nikon SU-800 Commander flash head, required to access the F6’s CLS functions. The letters and numbers visible in the SU-800 display indicate the Channels each flash can use for individual control. Light levels are set on the Commander head and wirelessly communicated to remote Speed Lights. Pretty slick. The SU-800 Commander head (center) allows control over each “remote” flash via the menu. Here the SB-800 (left) is shown in Group A; the SB-R200 (right) is shown in Group B. Each group allows independent control of power levels. Nikon SB-800: the long-time workhorse of the Creative Lighting System. The SB-800 menu system is a little more cryptic than the newer SB-900 series, but not prone to shut off due to overheating issues like the 900 is. b) At least one CLS-compatible flash, which means anything after the Nikon SB-300 and up. For this shot I’ll be using the SU-800, SB-800 Speedlight and the diminutive SB-R200 Speedlight. SB-R200 Speedlight, part of the Nikon’s R1C1 Macro Kit. I use these flexible little guys for all kinds of things. They’re small, portable, just enough power to breathe life into – but not overpower – the scene. The SB-800 set to “REMOTE.” Interacting with flash settings is accomplished from the Commander head. To reinforce how simple CLS is to use I’ll keep it brief. The concept is simple: the SU-800 commander head communicates wirelessly with the other flashes and tells them when – and how bright to fire. The other flashes are simply set to “REMOTE” mode – ready to receive instructions from the Commander. Because I’m going through the trouble to do this on film – film is cheap and I’m going to make the most of the opportunity. I devoted a full roll of Ilford FP4+ to bracket flash output and depth of field. Another nice thing about having plenty of images to choose from is if film acquires some imperfections in processing such as water spots or scratches there are plenty of other frames to choose from. Sometimes those analog anomalies add to “the look,” other times they don’t. You can see there’s no specific flash power output; i.e., what the flash on Channel 1A was set to vs. 1B. Keeping notes on such things helps in future projects. The PhotoMemo Photographer’s Memo Book below (picked up from Mike Padua’s shootfilmco.com web site) came in handy to record the different steps – things that weren’t recorded in EXIF data. After shooting, developing (Ilford DDX at 1:4 for 10 minutes) and scanning (Nikon LS-5000), Meta35 was used to marry the EXIF data with each frame. The final result was the frame I felt best balanced light levels, depth of field and overall look and feel. To state the obvious – yes, it would have been easier to do this digitally. But for my creative goals there was no substitute for representing this vintage item in anything other than black and white film. I was particularly interested in how film rendered the different textures and imperfections in the smooth but aged metal finish of the thermos, the shiny metal cap and of course that beautiful knit sock complete with frayed threads dangling. From the moment I saw it – it had to be film. Photographer’s PhotoMemo book from shootfilmco.com. Inexpensive, well thought out and easy to have with you in a shirt pocket. If questions come to mind as you explore CLS shoot me a note on our newly re-vamped contact page. I’d love to see anyone with a F6 look into Nikon’s Creative Lighting System. It’s a unique feature and will change your photography for the better.